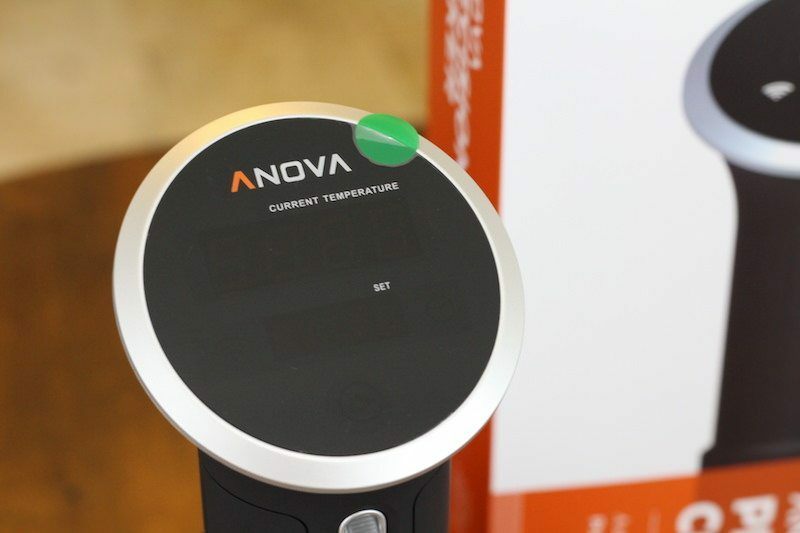 Anova Sous Vide Review: Is Good Enough Good Enough? 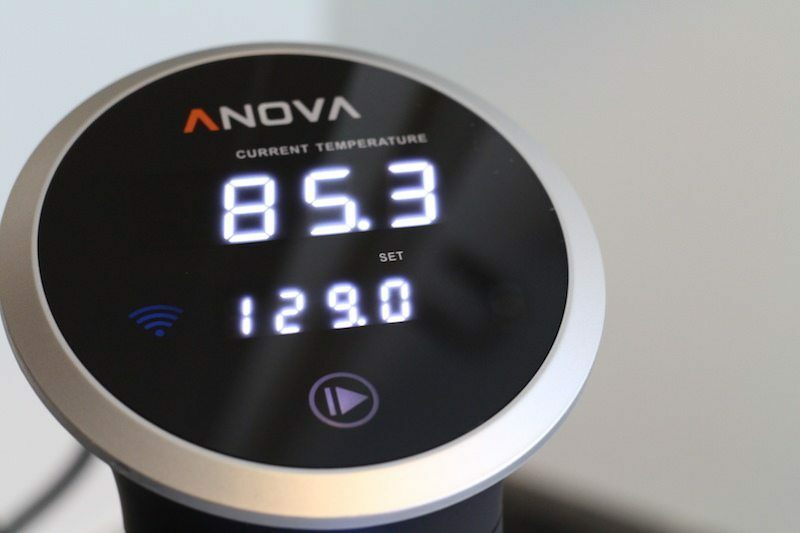 Update: The Anova Nano is out now. It's a compact, less-powerful version than the Gen 2 model. In continuing with my reviews of wifi-enabled sous vide immersion circulators, I bought and tested the Anova Precision Cooker. In short, this is clearly one of the best immersion circulators that I've tested before, so it lives up to the hype of 1200+ reviews on Amazon and an almost five star rating. 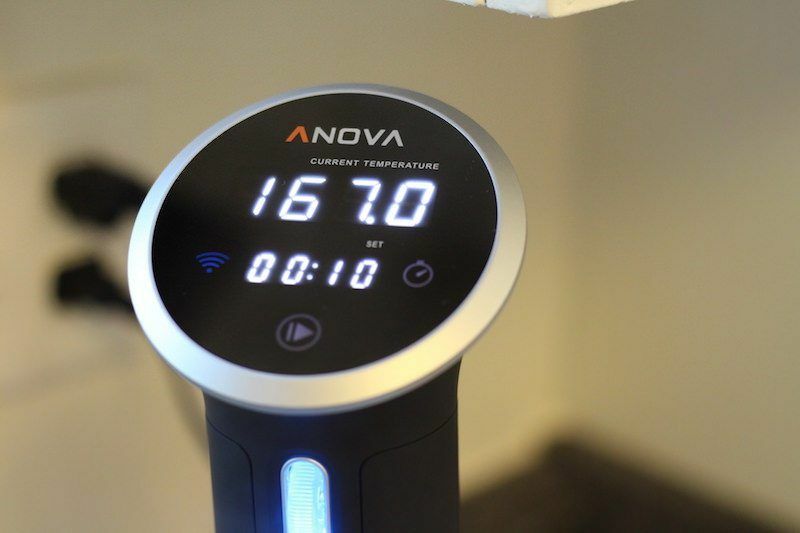 Anova clearly rocked the sous vide scene when it came out many years ago. However, there are now more than 20 devices you can buy on Amazon, ranging from less than half the price of Anova, to significantly more expensive. Does the Anova sous vide cooker still rock like it did when it first came out? Anova really has their packaging down, and opening their product really was a pleasant experience. For this review, I'm testing the 900 watt bluetooth + wifi version (Gen 2). There's also an 800 watt version (Gen 1), but if you're going to go cheaper, you might as well get the updated Nano. The basic idea behind immersion circulators is that they are able to heat water to a very precise temperature, and hold it at that temperature for a long period of time. This cooks your food to a very precise degree, not overcooking and not undercooking it, leaving it juicy, flavorful, and safe to eat. Though the Anova Precision Cooker doesn't state on the sales page how accurate it is, we can assume that it's within 0.01 degrees. Even basic immersion circulators are able to make this claim, and we see the temperature displayed in 1/10 degrees. 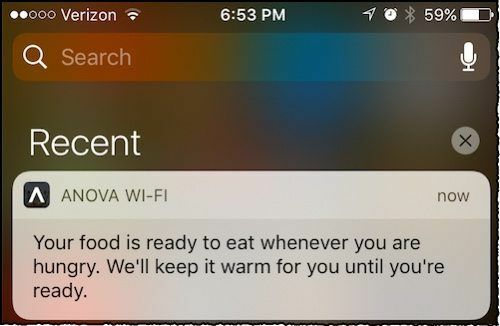 The current temperature and target temperature are displayed on the face of the anova. Once you start cooking, the target temperature (the bottom one) display will flash back and forth between how much time is left in your cook session. Kudos to the design team. It's a great looking device! The clamp that holds the Anova on the side of water vessel is the “screw” kind, where you need to twist open and twist closed to keep the cooker in place. Personally, I prefer the “lever” or “clamp” style. You can see the two compared in the image below. Even though I prefer the clamp style, Anova has designed and engineer a very ergonomic solution. The matte-black surface of the clamp feels to the touch exactly how it looks. It's very soft and smooth – high quality stuff! See the Anova on the right and another brand on the left. Notice the quality difference! You can also break it down for storage – but why would you want to? I love sous vide cooking too much. The Anova App: Does It Ruin The Show? 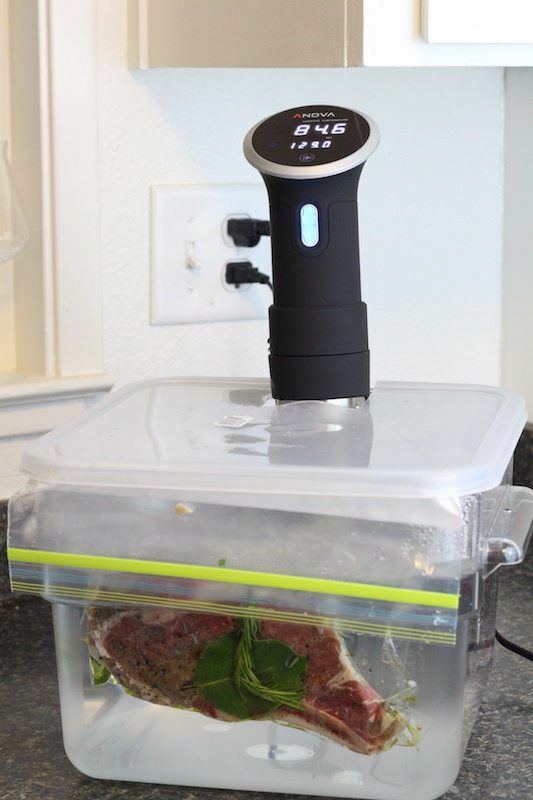 Though there are several sous vide cookers that can be used remotely, Anova does a better job than most. Setting up the wifi connection is very simple. Download the app and it'll take you through the pairing process. The hardest part is remembering what your wifi password is LOL. Unfortunately, the app experience needs some improvement. It is better than the Gourmia app in many ways, but is not nearly as good as the Joule app. I'm very surprised that with such a meticulously designed product, they really dropped the ball on the user interface of the product. That being said, there are some cool features about it, and it's not the worst out there! While reviewing the Anova cooker, right off the bat I found it confusing to find where the temperature guides were. Turns out, they are all from the community, and user generated. No thanks. I'd like some professionals making these please. So I went to “guide”, and there are a few general tips, but not many! Under “beef”, it only contains brisket. Under “chicken”, it only contains breast and thigh. Why is there a corn category? Who knows. Side Note: A million percent better is the Sous Vide ºC app (Apple). It's got every detailed type of food you'd like to make, with no unnecessary complicated recipes. Just the type of thing you're cooking, and temp/time suggestion based on doneness. You can even connect it to WiFi sous vide devices, including the Anova. It's $3.99, but totally worth it if you cook sous vide often with an Anova. I cooked some filet mignon today. Instead of having a “filet mignon” setting, I had to find a recipe for filet mignon with mushroom sauce. It also didn't ask how thick the cut of meat the recommended cook time was for. I was going for medium rare, but it was less done that I like, despite having cooked at 133 Fº for 45 minutes. Other sources I checked has a steak that size cooking for 60 or 90 minutes. Despite my gripes about the user friendliness of the app, once you get going, it's easy enough to use. 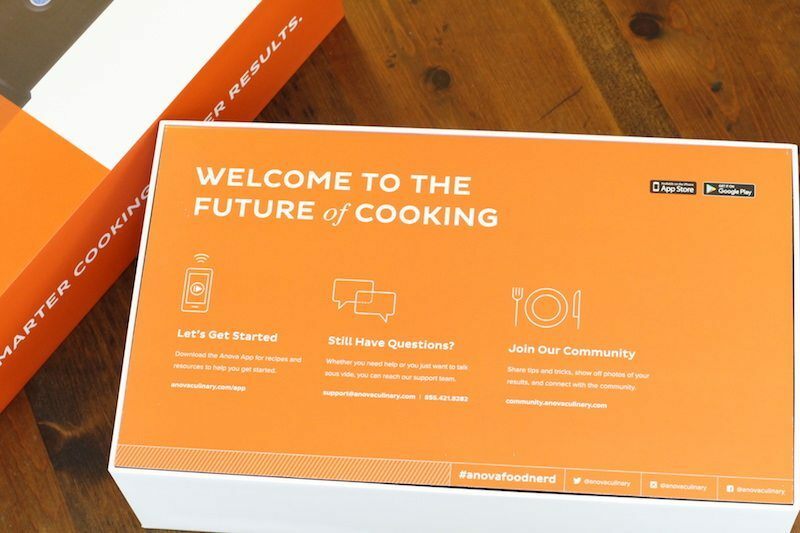 Set the temperature and time, then you get notified during each step of the cooking process including water heating, target temperature reached, and finished cooking. It's a very, very quiet immersion circulator! Having tested and reviewed so many immersion circulators, I've become accustomed to the low hum and gurgle of water heating and circulating in the background of my life. However, I had to walk into the kitchen a few times while testing the Anova to make sure it was still working. I just could not hear it while I was in the other room. This was surprising to me. I have other circulators that put out a similar 800 or 900 watts of energy and were much louder. We're not talking jackhammers here – just gurgling water, but still, it was a noticeable difference. Perhaps it has to do with the type of water pump they use? Anyway, if you have used immersion circulators before and were annoyed by the sound they made, the Anova Precision Cooker solves that issue. The only other one that is as quiet would be the Joule. Because this was one of the more popular sous vide cookers out there I took extra time to make a few recipes with it. Below, you can see I made a bone-in ribeye steak. I like to place a variety of herbs in with my steaks. Do you? Everything went as planned. 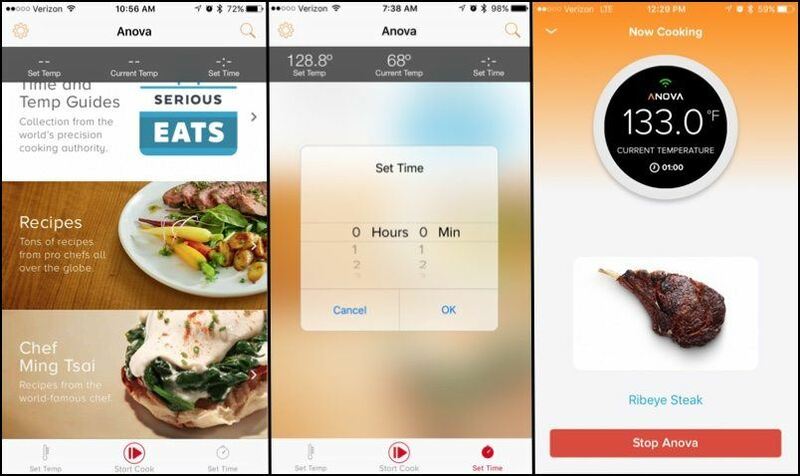 The first couple times I cooked I made sure to use the Anova app to get a feel for it, however, as I continued to use the device I found myself using the time settings from a competitors app, and then just entering them manually into the Anova app. The Anova sous vide cooker in its full glory! One thing that was quite obvious cooking with Anova however, is that it has a weaker heating element. The basic, 1st generation model has only 800 watts of power, and the second generation only has 900 watts. I used this to cook eggs in the morning once and it was quite a painful experience being hungry and waiting for my water to heat slowly. I suppose I could operate the app from my bed, or preheat water in a pot if I really wanted to though. The Gourmia GSV150 has a lot more power, and will heat your water faster. (One trick I use now is to simply fill my water container with hot instead of cold water, and the preheating process is much faster). in case you were wondering, my steak turned out awesome. Just how I like it! Broken down into plain English, here's what you're looking at: The power is on the lower end of the scale. 800 watts for the bluetooth-only version is pretty weak. It takes much longer to heat water than a 1200 watt unit. 900 watts is a little better, and is more comparable to other popular units which use about 1000 or 1100 watts. 2.4 GPM is quite good, and other devices do as little as 1.5 GPM and still claim to be able to maintain temperature in 10 gallons of water. 3 GPM is about the max that I've seen, so Anova is doing great in this category, especially considering that it's so quite compared to others! The Anova is about right very light weight as well. 2.5 pounds is not the smallest available (1.3 lbs, Joule), but it's a heck of a lot lighter than the six-pound Sansaire. Even the Gourmia units are about 3lbs. However, it's size is a little bigger than other immersion circulators you can buy nowadays. 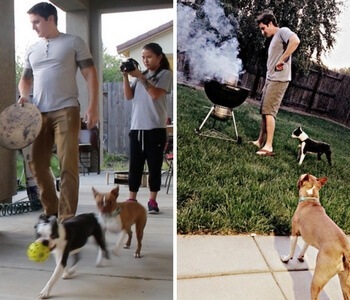 Here are some comparison pictures for reference. Overall, after all this testing, Anova is my 2nd favorite device. It's sleek, the app is decent (despite my gripes), and it gets the job done accurately. Let's get into price. The Amazon affiliate program doesn't allow posting prices because they fluctuate from day to day, so I'll discuss it in broader terms. Previously, Anova was sold at a comparable price to the Sansaire and Joule. Now, Anova is the cheapest of the three. The GSV150 is the newest generation of Gourmia immersion circulators and is usually about 50% cheaper than the Anova. Older Gourmia models are even cheaper! The Anova Precision Cooker is awesome appliance, and worth every penny. However, if you were really looking forward to the wifi cooking, I highly recommend you check out my Joule review. 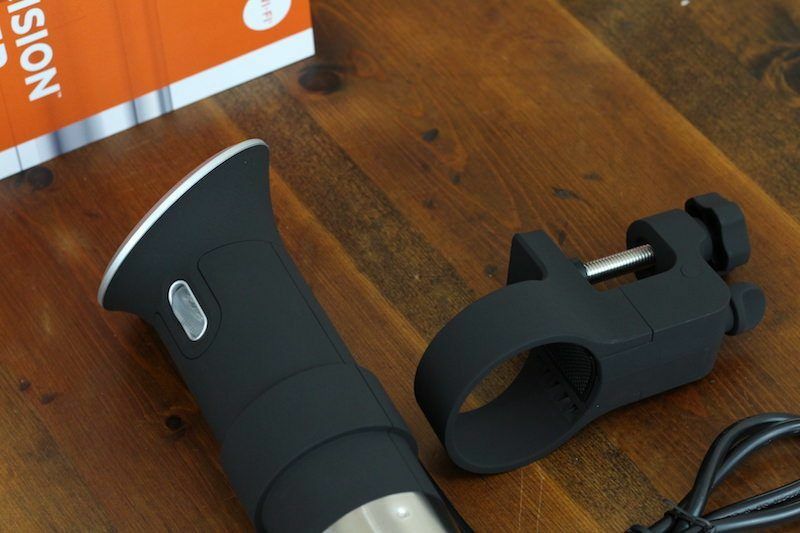 The Joule really bridges the gap between tech and cooking much more smoothly than Anova. The one main downside to to the Joule is that there's no manual cook settings. Everything must be done through your phone! Who Is The Anova Precision Cooker Best For? It's really hard to recommend the Anova immersion circulator now that they have to compete with the Joule. Joule is smaller, more powerful, and has a better app. In my mind, there are a couple main reasons to get the Anova cooker over the Joule. You can get these options individually with other cookers out there, but not all in one package like you can with Anova! 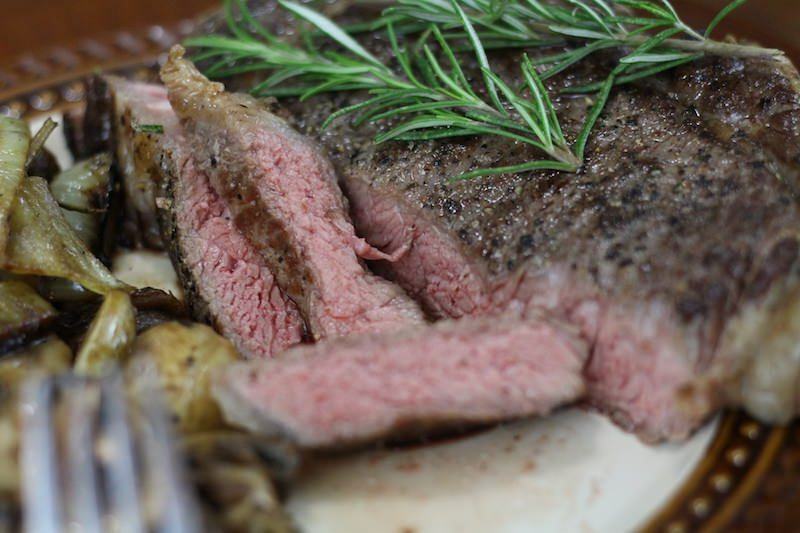 ==> Get The Anova Precision Cooker! 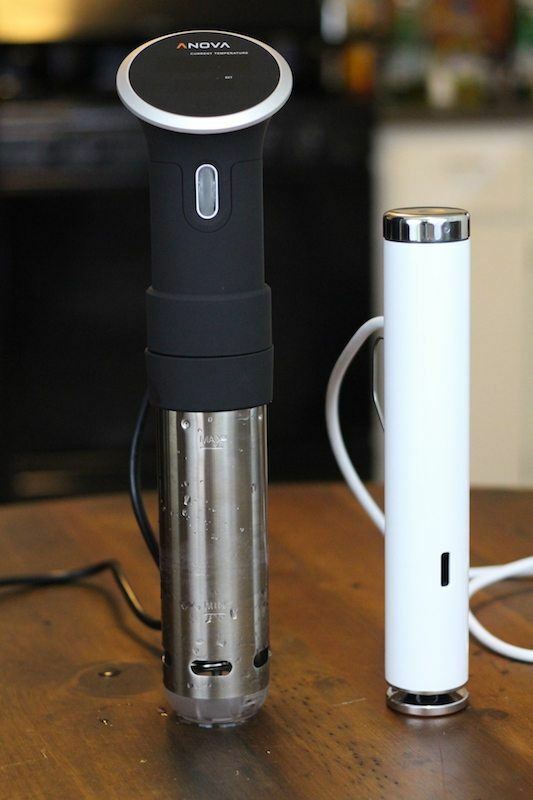 The Anova Precision sous vide cooker circulator was a very cool product to test out. Unfortunately, that coolness was lessened slightly because I tried an even even cooler product on the market. 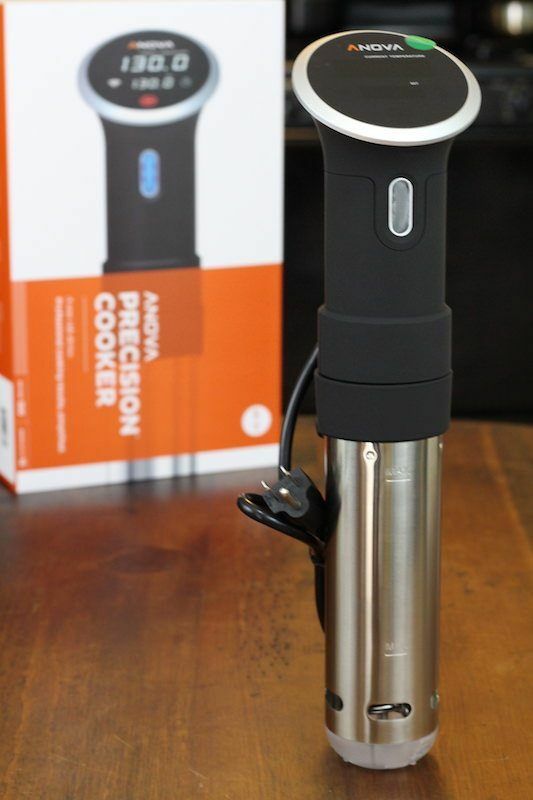 ==> Get the Anova Precision Cooker Here! Also, did you know that there's a cooking container made specifically for cooking sous vide, plus a lid that matches and exactly fits your new Anova? 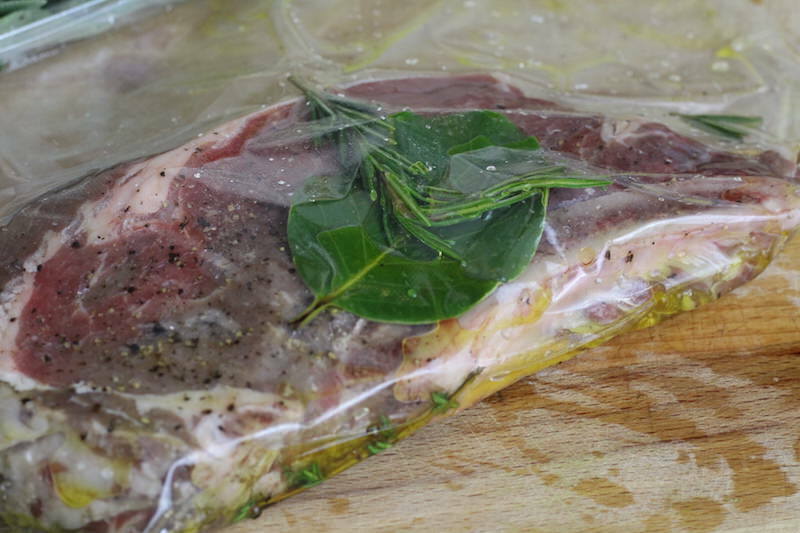 Food grade polycarbonate containers are less heat conductive, which means less heat loss. Also, putting a lid on top of your container will result in less heat loss, so you will not have to refill your water bath even while doing long cook times. The trouble with lids is that you can't fit your circulator in the water with a lid on! LIPAVI has sovled this problem by making containers and specific-shaped lids for a few popular immersion circulators. Anova is one of them! Get the lid that fits anova here. 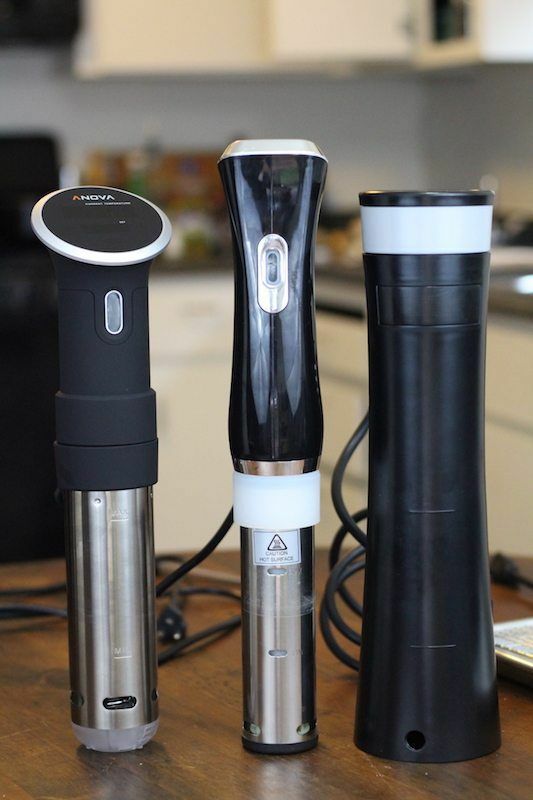 You are here: Home / Immersion Circulators / Anova Sous Vide Review: Is Good Enough Good Enough? 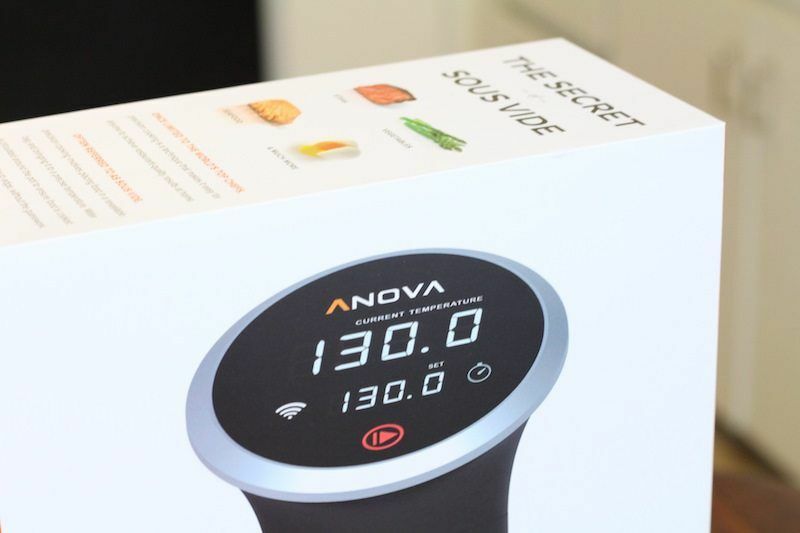 I must admit you did a great job in this review on Anova Sous Vide. I received my Anova for Christmas last year and it has been used every week at least once. I had no idea what sous vide was before. I really like the way the flavors cook into the meat. Though I am not a roast beef fan but I think a 24 hour roast is the best i have ever had. The wifi is not that big a deal to me but I have used it a few times. Great article, great job. I think the Wifi is not a big deal to a lot of people, but I actually like it. I actually leave my meat cooking in the water bath while I go out and do something else quite a bit. Sometimes I’ll walk the dog, or I might set it going at about 10AM then come back to a nice juicy steak for lunch at 12 on the weekends. Works out great! Firstly, I must commend you for a well structured and insightful post. I don’t think one could get any better review of the ANOVA sous vide. My family got this anova earlier this year and has become a routine to actually make use of this at least once in every week. Though, she was clueless about sous vide until she saw some videos on YouTube and also conducted some researches. how I wished she got to see this review earlier. It would have saved her a ton of stress. I’m not really a fan of the WiFi, it doesn’t seem much of a big deal to me though but I like everything about the product.